David Kelley, a founder of the well-known Silicon Valley design and consulting firm IDEO, believes that creativity is not just something that some people are born with and some aren’t; and that it’s not just something restricted to artists, musicians or writers. Instead, it’s like most things, he believes creative ability is something that everyone possesses and that it’s like a muscle; you can exercise, practice and improve on it and as a result, gain confidence from it. Daily our clients rely on us to continuously push creative boundaries and devise fresh, imaginative ideas for their brands. Thus it’s of the utmost importance for us to be constantly on top of our creative game and constantly demonstrating our creative confidence. So how can hone and flex your creative muscle and boost your creative confidence? Allow (even encourage) Yourself to Daydream. David Kelley calls this practicing “relaxed attention” and in order to harness the power of it, we must do this at a time when our mind is idle, and consider a problem or obstacle that is in our way. When daydreaming, you’re not just wasting time wishing you were somewhere else, a lot of times a new idea will suddenly emerge as you dream, and be sure to document those ideas, write them down. They very well could be the next breakthrough idea for one of you or one of your clients. It’s important to write your ideas down. A lot of time, our creative self-esteem decreases because somewhere along the way, we stopped listening to our own creative spirit. The next time something random pops into your head, listen to it and write it down! Go old school and keep a special notebook, binder or folder solely designated to your ideas. Successful creative people understand that all ideas may hold value at some point, but we can only focus on creating and implementing them one at a time. Remember when we said honing your creativity is like flexing a muscle? Well a routine means spending a little time each day flexing that muscle. Flexing your muscle should be a habit you commit your time and energy to each day. Designing this routine, and implanting it into your day can have a powerful impact on your business success and your client’s success. Writing, journaling, doodling observing the creative world online and around can be something to include in your routine, there is no wrong way to express your creativity. When solving a problem, or trying to come up with a new idea for one of our clients, it’s important to think about the situation from many different viewpoints. We challenge ourselves to not just settle with looking at it from a perspective we are comfortable with, but stretch ourselves to push our comfort zone limits and develop ideas that are unique and that will constantly create a conversation about our clients brands. Wearing multiple hats when you’re looking for that next idea will create many fresh perspectives and might guide you to where you may be out of alignment your ideas. One of the best ways to come up with creative ideas is to talk to other people. Socializing can be an incredible source of inspiration and originality. Here at Next-Mark, we are constantly bouncing ideas off one another and getting constructive feedback; it’s an important part of our creative process. Everyone has a different way of thinking, so it’s essential to talk to your team, friends or sometimes even a complete stranger to gain a different perspective on your ideas. Most of the time someone will offer something that you had not even thought about that can take your idea to the next level. At Next-Mark, being creative and inventive is critical to our success, and the success of our clients. 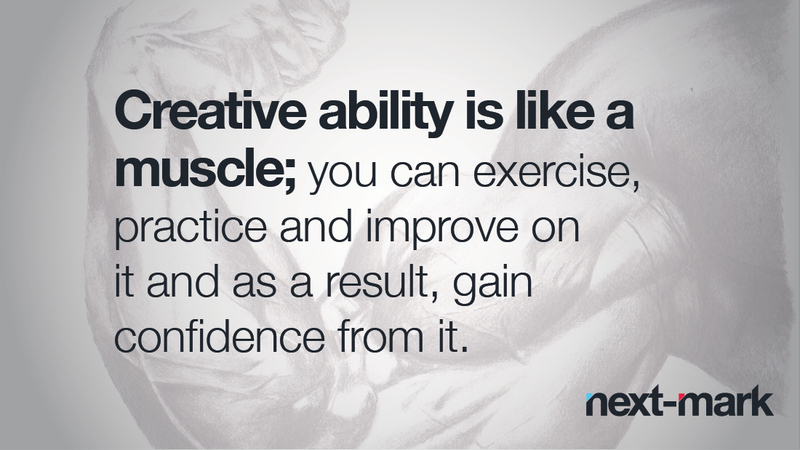 We constantly exercise our creative muscles in order to maintain our creative confidence. Use these tips to boost and maintain yours. If you have any other tips, write them down and send to us! Latest news: What does our playlist say about us?